This instruction by Coy HQ Rear details responsibilities for managing the return of the company back into Nui Dat lines between operations. It was produced with the help of W2 Coy for the arrival of W3 into Vietnam in November 1969 and was amended as required to suit circumstances - for example it is doubtful the BBQ was delayed 48-hours. After a 3-4 week operation it would be routine to be pulled from the field mid-afternoon, usually by helicopter, landing back at Eagle Farm LZ and walking to the tent lines nearby. Although the process differed between platoons a number of post-operatio n actions were required for individuals to wind down from one operation while preparing for the next. During the first 30 minutes back in the tent lines individuals who had hardly spoken above a whisper in weeks would slowly start to come out of their shells and the amount of ribald commentary would gradually escalate back to normal non-tactical levels. Ammunition was secured, especially all types of grenades and other explosives. Weapons were unloaded, disassembled, and cleaned. There was usually a weapon check by the Pl Sgt looking for obvious damage or neglect, after which the weapo ns were reassembled. 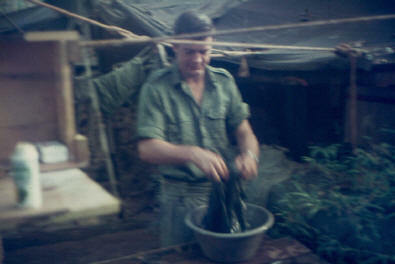 Radios were also cleaned and checked by the Coy HQ signals detachment commander and radio codes collected and destroyed. Once the dirty work was finished individuals headed for the showers. 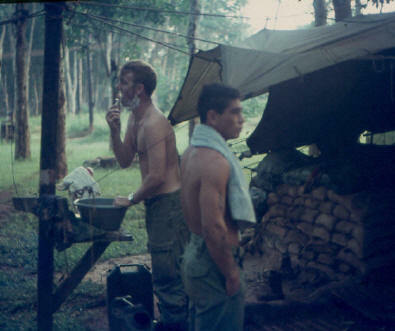 These were provided by field canvas shower buckets with a nozzle and required regular refilling to finish the effort. It was here that the obvious stench of weeks of bush living impacted on those now clean, although it was very obvious that base staff had been avoiding the platoon lines in the period before the showers. Following the shower individuals would report to a company medical person to be inspected for bush sores and other ailments. Those with rashes, tinea, infected cuts, and other injuries were directed to the official company medic for processing and suitable treatment. By now the accepted dress was shorts and jandals to allow the skin exposure to fresh air. The individual’s stinking bush clothing was rolled into a pile and carried disdainfully to the CQMS store for the storemen to later deliver to the Vietnamese dhobi outside the Nui Dat wire. One sympathised with the storemen needing to handle these piles of rancid material but generally it was accepted that ‘it was dirty work but someone had to do it…’ The troops would also uplift clean laundry left behind from the previous period in base. At this point individuals started to relax, mail was delivered and field packs were emptied and the contents serviced. Old rations and water were discarded and litter [always carried from the field] was disposed of. Where necessary webbing and packs were scrubbed and placed outside to dry, and some personal dhobi was attempted. Toward 5PM platoons would start to a ssemble to have the various task lists checked off by the Pl Sgt and then individuals would be dismissed to get dressed in clean jungle greens and boots for the traditional company BBQ. The company BBQ would start a process that allowed the individuals to pass back into a civilised environment by removing the strictures of living tactically in the bush. 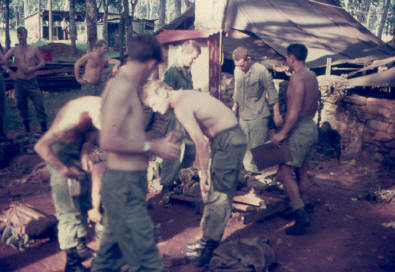 The intention in Vietnam was the same as at any BBQ back in NZ, to have good fun with mates. 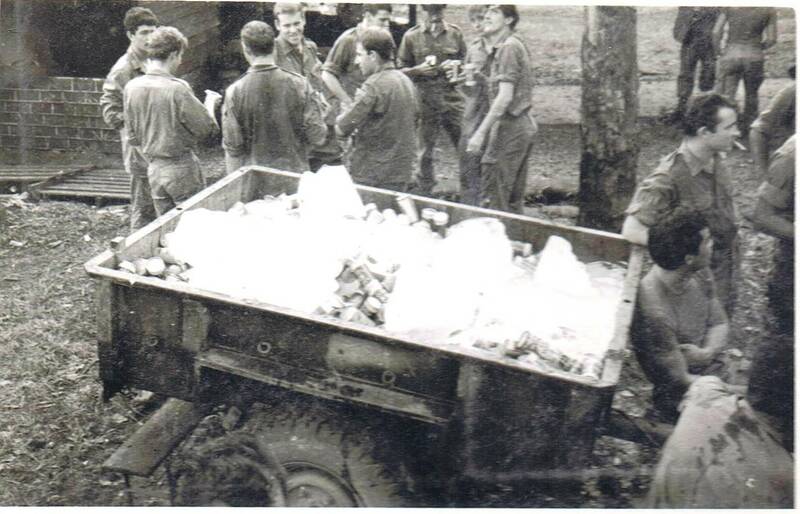 The company cooks had prepared piles of fresh meat for grilling and the accumulated allowances of beer and goffers were paraded in vehicle trailers filled with ice. Music was provided, often by individuals with guitars, and individuals started to circulate to catch up with gossip from mates in other platoons, and with visitors. After a suitably short period [i.e. before the sudden introduction of alcohol caused problems] Major Torrance would step in as ‘master of ceremonies’ to acknowledge birthdays, pronounce on great individual efforts and minor misdemeanours, and to make other announcements. The remainder of the evening was then devoted to scoffing the fresh food, emptying the beer trailers, and telling the biggest lies. After a period of socialising with the troops the officers and SNCO’s normally retired to their ow n combined mess. There were no duties overnight for those returning from operations. The following morning, unless the Company was travelling to Vung Tau for a 48-hour break, platoons started preparations to deploy again. All the preparation was directed by the platoon sergeants under the watchful eye of the CSM and Coy 2ic. 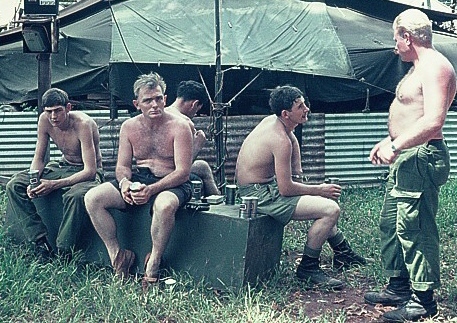 The first priority was to improve the health of individuals who had likely lost several kilograms in body weight during a prolonged bush period where they carried heavy weights while moving and received limited nutritional value from the combat rations supplied. Individuals would also be suffering from bites and skin infections from sleeping on the ground and moving among the local flora, and have physical issues caused from chaff, damage to the feet from tinea, and bruising from heavy packs, weapons and other equipment; diarrhoea might also be an issue with the addition of fresh food to the diet. Those requiring medical care were paraded to the battalion RAP for a ssessment and treatment - some might be declared ‘LOB’ until healed sufficiently. Dress remained casual buff order [bare upper body]. Meals were from fresh staples where available and seconds were encouraged. Water, cordial powder and other beverages were freely available. Sport was played [mainly volleyball] and other informal social gatherings were encouraged. The company bar would open each evening, and individuals could visit the makeshift cinema to hopefully watch a 16mm movie through without breakages. Some soldiers would leave the base on routine work [dhobi run or visit the Baria orphanage] while others would unofficially ‘shoot through’ to visit friends in 161 Battery or the other company lines. Some had to be retrieved at short notice if a sudden deployment was ordered. There was only one public toll phone for the entire Task Force but letter writing and taped messages were encouraged. Moral support might be required for people who had suffered a loss at home, such as a death within the family, or the dreaded ‘Dear John’ letter from an ex-girlfriend. New Zealand padre’s were available to help and always attended the company BBQ to offer a willing ear. Weapons would be taken in batches to the armourer for checks and repairs. Signallers would gather and radios would be checked. Non-operational administration would be dealt with by Coy HQ clerks, and parties would march down to NZ Component to check and sometimes draw pay from their pay books. Individuals were entitled to send duty-free alcohol back to family in New Zealand and these would be purchased and prepared for postage. 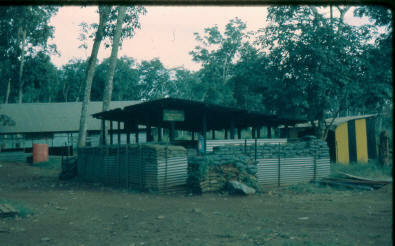 Platoon ammunition stocks were checked and replacement items called forward by the CQMS to the Company ammunition bunker. Damaged equipment was replaced or repaired under direction of the CQMS. Worn boots and clothing were exchanged as necessary. A series of Company tactical leadership meetings might occur covering ‘lessons learnt’ and improvements wanted. Replacement radio codes would be issued and intelligence summaries read. New maps would be prepared. 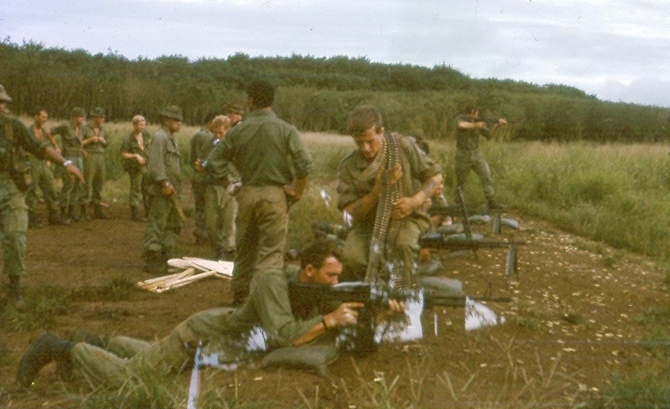 New people posted into the platoon would be organised into a section, equipped for their role and given individual training on new equipment, weapons and small group tactics and other drills. Platoon and section briefings would be held to update the soldiers on the current tactical situation. Where possible the sections would rotate out to the rifle range beyond the perimeter wire to test fire their personal weapons and practice with other section weapons such as the M60 MG, M79 grenade launcher and M72 ‘bunker buster’. In this period some sections might be directed to do an overnight TAOR patrol outside the base perimeter. In the period just prior to the next 3-4 week deployment O groups would occur, a full load of ammunition would be distributed among sections, and spare batteries and other essential stores would be collected and distributed. Combat rations would be organised and issued. While the period prior to deployment was busy it was noticeable that individuals became quieter and perhaps withdrawn and final preparations and checks of equipment had an intensity previously missing. The new operational deployment was always a nervous affair and it was often not until the clean clothes were saturated with sweat and the evening bush bedspace was ready that soldiers were able to settle down and accept that the process was starting again.